It is 2013 and we are going through a second creative revolution, we are changing the way that stories are told. The revolution is being driven by art, copy and code. We are no longer looking for stale ads, books, or films; we are looking to experience the story. Google is interested in keeping us active in the web, and clicking away… so they are livening things up and making ads more interactive. Code is being added to the core creative process, enabling new forms of brand expression and engagement. 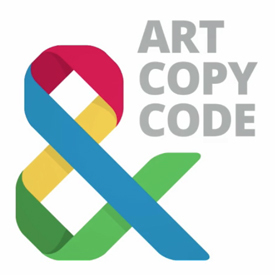 Art, copy and code is the creative team for the connected word. The new program works with brands and marketers to show how Google tech can work with them to produce great creative work. Brands are are being converted into living, evolving, changing and real; interacting with the environment and its people at all touchpoints: across mediums and devices, ads and apps in the physical and digital worlds. Google is currently experimenting this new movement with innovative brands such as Volkswagen, Burberry, and Adidas and partnering them up with storytellers and makers. Experiments are being run through different ads, apps, devices and mobile to reimagine advertisement´s future. The first partner project is a new social driving experience—Volkswagen Smileage. For updates of all experiments subscribe at ArtCopyCode.com. This entry was posted on March 11, 2013 by mcquant in Cases and tagged Art, Art copy, Creative Revolution, Creative Team, Digital, Google, Technology, word art.